Why is it that pork tastes so delicious with fruit? One of my favorite and first recipes I posted on this blog was for roast pork with a cherry rhubarb sauce. Fruit is a great way to dress up humble pork cuts, especially when you are following a paleo autoimmune protocol and not eating nightshades or other spices. 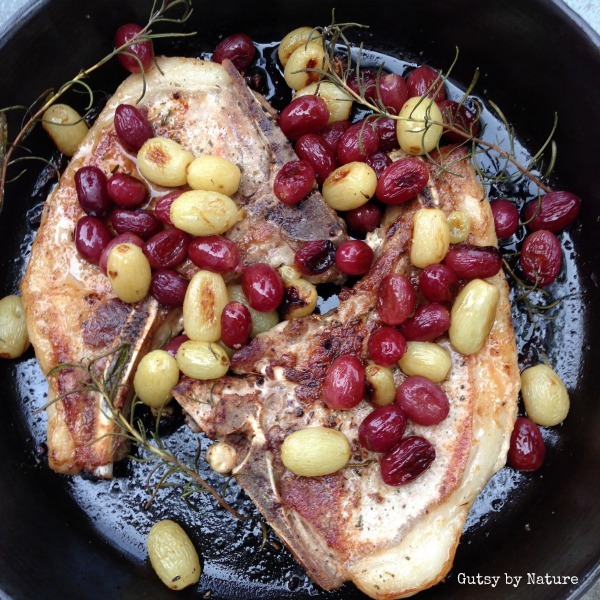 This dish for pork chops with roasted grapes and herbs was born after a long and busy day when I wanted an easy delicious meal on the table in 30 minutes or less. I really didn’t plan to write it up because it is almost too simple to even be called a recipe, but it turned out to be so tasty and photographed so beautifully that it only seemed right to share it with the world. The inspiration for this recipe came from a recipe I saw on Pinterest (are you as obsessed with Pinterest as I am?) from the great home cook driven site Food52. But I streamlined and simplified my version even more and used the technique for perfect pork chops from the paleo pork bible, Beyond Bacon. I used a mix of green and red grapes because that is what we had in the refrigerator, but this would work fine with just one color. For the herbs I used a mixture of rosemary and sage, but think it would be delicious with just one of those or any other herb you like. This dish is appropriate for people on a paleo autoimmune protocol, SCD, or GAPS diet without any modifications. For low-FODMAP be cautious about the quantity of the grapes, which are moderately high in fructose. Humble ingredients are elevated to make an elegant dish through simple cooking techniques and fresh herbs. On a small rimmed cookie sheet or baking dish, toss grapes with melted fat and herbs. Spring with salt and place in oven to roast for about 20 minutes, or until grapes start to brown and burst open. Meanwhile, salt pork chops and heat a cast iron skillet over medium-high flame. Sear chops until brown, about 2-4 minutes each side. Transfer skillet with pork chops to oven and roast for 10 minutes. Remove from oven and allow pork chops to rest in pan for another 10 minutes. 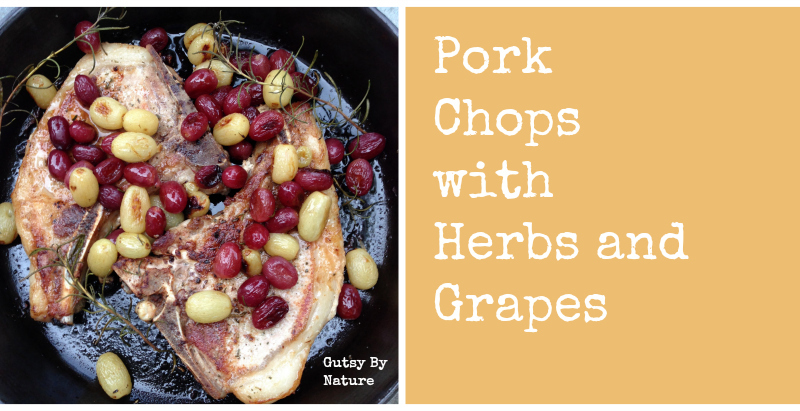 Toss grapes over top pork chops and serve.